food network addict: Mario, Emeril, & Bobby Get 2 hr White House Special - A Sign of Importance or a Consolation Prize For Dwindling Network Time? 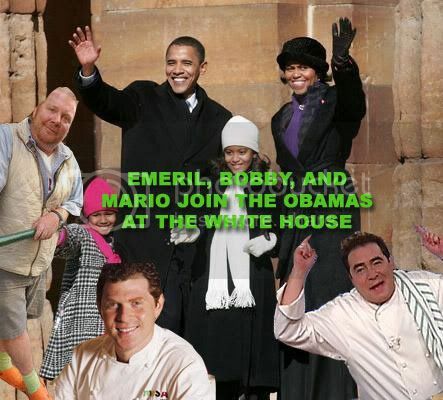 Mario, Emeril, & Bobby Get 2 hr White House Special - A Sign of Importance or a Consolation Prize For Dwindling Network Time? When you get an invite from the White House you send in the big guns. And at Food Network, to many people, those would be Mario Batali, Bobby Flay, and Emeril Lagasse... or they would have used to think that. Apart from Bobby and his ever-presence on the channel, Mario and Bobby have all but disappeared into rerunville. So when I read that the three big boys would be appearing in a two-hour Super Chef Battle episode of Iron Chef America, featuring Michelle Obama and White House Executive Chef Cristeta Comerford, I wondered... is this a sign of who's really important at Food Network, or just a consolation prize to Mario and Emeril? Food Network stars Mario Batali, Bobby Flay and Emeril Lagasse travel to the White House to take part in an unprecedented culinary competition in Super Chef Battle, a special two-hour episode of Iron Chef America. Greeted by First Lady Michelle Obama, the chefs are joined by White House Executive Chef Cristeta Comerford and receive their challenge: create a meal for America using The White House Kitchen Garden’s produce as their secret ingredients. For one, Emeril isn't even an Iron Chef. Why was he asked to come along and not, say, Cat Cora, the only female Iron Chef? Alton Brown is coming along for his commentary, and Ted Allen will serve as a guest floor reporter. Even Food Network kind-of star Nigella Lawson (she's huge in the UK; hasn't entirely caught on here for whatever reason) will serve as one of the judges, which would normally be a bit of a no-no. Ted Allen had inferred in recent interviews that he wouldn't serve as a judge anymore due to his more established relationship with Food Network as host of two series, Chopped and Food Detectives. It makes sense that Food Network stars shouldn't serve as judges, actually. Alex Guarnaschelli used to judge Iron Chef America battles, and now her new show Alex's Day Off is produced by Bobby Flay. Who knows how her vote might get swayed if she had to choose between Bobby and the challenger. The special episode premieres Sunday, January 3rd at 8pm ET/PT. Usage Note: Infer is sometimes confused with imply, but the distinction is a useful one. When we say that a speaker or sentence implies something, we mean that it is conveyed or suggested without being stated outright: When the mayor said that she would not rule out a business tax increase, she implied (not inferred) that some taxes might be raised. Inference, on the other hand, is the activity performed by a reader or interpreter in drawing conclusions that are not explicit in what is said: When the mayor said that she would not rule out a tax increase, we inferred that she had been consulting with some new financial advisers, since her old advisers were in favor of tax reductions. Oops, forgot to give credit where due. See above reference. i'm becoming a big fan of nigella. for a while i didn't understand her, but i guess i'm coming around. as for emeril i want him back with new episodes...the network's missing something without him. Thank your Lucky Stars that Guy Fee-Yetti and Melissa the Bacon Mom aren't participating. I mean, really. Nigella will be on Top Chef next week. Love the new Annie header! I think this might have to do with the relaunch of FLN as the "Cooking Channel." With all of the years of Mario, Bobby and Emeril inventory, it is a great way to draw attention to it, especially if they are the big three on that new network. They also didn't ask ol' Paula Deen , Unca Bubba or the good ol' boy contingent the Deen Bubbas ! Maybe these guys were invited because they are the most deserving? Good reason. Good point Ol'Liz about Fee-Eddy and some of the other pretend chefs not being considered. While your buddy Tuschman racked his brain trying to figure out a way to get then involved, he probably figured in the end they could kill the buzz of legitimacy the 3 others brought. Probably wanted the Neelys and their "culinary elite" status to tie in somehow. Maybe Fee-Eddy couldn't pass a background check ? I have to agree with Alec on this one. The three are thoroughly experienced restaurateurs who made a good transition to showing home cooks how to do great food. Also a tacit acknowledgement that they helped make FN in the early days. J i am usually with you in many topics, but on this one i am not. The network should be happy they both say yes, many of us (chefs) respect Mario or Emeril for their business savvy and their skills, not so much "poquillo, ancho, pasilla chipotle flay " who will always be a wanna be. The rest of the FN line up are ingredients in a fruit cake , that is all they are. !